The Gig Harbor community is heating up. There are so many more places and events to go to that now it is getting hard to choose what to do. Just this weekend alone there are about 25 calendar listings on Event Resources Gig Harbor. No long can you say there is nothing to do. 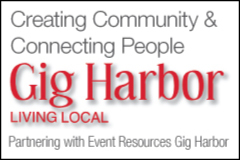 You will find it all on the Event Resources Gig Harbor Calendar. If it isn’t there you can add any public event at this link for free. Continue to check out the calendar and support the local businesses and entertainers.